New Delhi: January 23, 2013 was a sad day for Okhla residents hearing the matter after listing the matter for 27 times since July 8, 2009, Delhi High Court shifted the matter to Justice Swatanter Kumar headed National Green Tribunal in view of the Supreme Court order of August 9, 2012. The order said that the matter be shifted to the Tribunal with Court records within one week to be listed within one week. With this the High Court has shifted the Writ Petition (Civil) NO. 9901/2009 which was filed by the resident’s welfare association (RWA) of Sukhdev Vihar, Okhla against the municipal waste incineration power plant is being operated. The plant faces bitter opposition from residents, waste pickers and environmental groups. Residential colonies of Sukhdev Vihar, New friends Colony, Maharani Bagh, Haji Colony and Ghaffar Manzil have been agitating against this plant that has been set lawlessly. Adjacent to the plant are major institutions such as the Institute of Genomics and Integrative Biology (IGIB), Central Road Research Institute (CRRI), Apollo Hospital, Fortis Escorts Heart Institute and the Holy Family Hospital, besides several schools such as the Dev Samaj Public School. 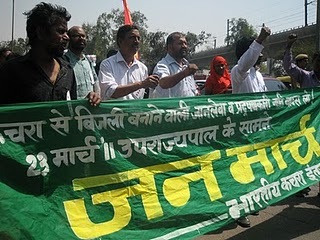 The Environment Minister had informed the Parliament that “complaints were received against the incineration of municipal waste and its likely harmful effects on the air quality and health of people in the Sukhdev Vihar/Okhla area due to the emissions from Waste-to – Energy plant at Okhla.” She admitted that “on four occasions out of ten, levels of Particulate matter (PM) exceeded the standard of 150 mg/Nm3”. She did not reveal anything about the emissions of Dioxins/furans which remains one of the core concerns. The company claims that “The facility has been installed with a sophisticated Continuous Emission Monitoring System (CEMS) supplied by Yokogawa Japan, one of the foremost technology suppliers in this field. The system is designed to measure SO2, NOx, CO2, O2 & HCL at chimney & ID Fan outlet. SO, NOx, CO2 is measured by Infra red principle, O2 is by zirconia cell, HCL is measured by using Gas filter co-relation IR based principle.” While this is being done by the company, what is the role of regulators like Delhi Pollution Control Committee and Central Pollution Control Board. Representatives of GTZ (German Technical Cooperation) led by Dr. Juergen Porst, Senior Advisor have stressed the need for a Disaster Management Plan in the very first meeting of the CPCB'sTechnical Expert Committee, which is annexed to the CPCB'sreport. But this does not find mention in the recommendations of the report. This finds reference in the minutes of the meeting annexed with the report. It underlines the possibility of disaster from the Timarpur-Okhla Waste to Energy Incinerator Plant, which is situated in a residential area.